Misleading, Unacceptable and Damaging Health Care! experience with hysterectomy. She is the author of Living and Learning with a Child Who Stutters. And she is the recipient of a Canada 125 Award in recognition of a significant contribution to the community. She has appeared on Canada AM, the Womens Television Network, The Phil Donahue Show, The Body and Health Show, and several other media to talk about the important topic of unnecessary hysterectomy in North America. 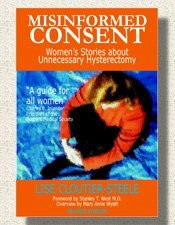 Author of Misinformed Consent: Women's Stories About Unnecessary Hysterectomies. * Empower women everywhere to demand better and more honest care. Women's/Menopause Physician, Erika Schwartz, M.D.